A photo from a previous Cambodia-Vietnam defense engagement. One of the aspects of this defense collaboration is in the maritime domain, as both sides seek to better manage challenges in their surrounding waters, including illegal fishing. One example is basic joint patrols focused on areas such as search and rescue and communication in order to build trust and cooperation and improve the level of coordination. These joint patrols have become a regular feature of the relationship and are held every few months. Earlier this month, this aspect of the maritime realm of ties was in the headlines with the holding of another iteration of the joint patrols. The 54th iteration of the joint patrol was held from March 14-15 in the waters of both nations. Per official Vietnamese accounts, this round of the scheduled patrols featured Ship 253 of Naval Region 5 of the Vietnam People’s Navy and Ship 1142 of the Royal Cambodian Navy. The patrols featured activities that related to suppressing piracy, preventing drug and other forms of trafficking, illegal immigration, illegal transport of weapons and explosives at sea, conducting search and rescue, and protecting the maritime environment. In addition to this, naval personnel also engaged in other activities, including practicing signal information, lamplight-signaling, semaphore, and organizing exchange activities at sea. As with previous iterations, few additional details and specifics were publicly disclosed about exactly what these activities involved and what other discussions occurred, beyond both sides noting that they had occurred. Both Vietnam and Cambodia made a point of mentioning how the patrol’s success contributed to the advancement of ties as well as continuing to preserve a peaceful and stable environment in their waters. Nonetheless, such activities will continue to be important to watch within the broader perspective of Cambodia-Vietnam defense relations amid wider domestic and international developments. 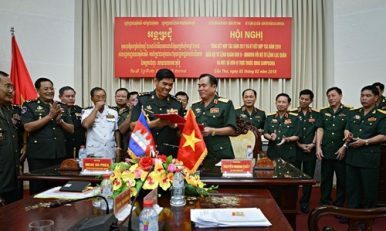 Vietnam-Cambodia Joint Patrols Highlight Defense TiesWhat Will the Next China-Cambodia Military Exercise Look Like?What's in the First Vietnam Navy Vessel Visit to Myanmar?Why China’s New Cambodia Military Boost MattersWhat’s Next for Vietnam-Cambodia Border Cooperation?